"Jewish Pink Elephant" by Rich Dweck: "The New ‘Morethodox’ Rabbi Asher Lopatin succeeds Avi Weiss at an influential seminary, offering a pluralistic version of Orthodoxy"
"The New ‘Morethodox’ Rabbi Asher Lopatin succeeds Avi Weiss at an influential seminary, offering a pluralistic version of Orthodoxy"
Yehsivat Chovevei Torah gala dinner. Avi Weiss has always been known as an unapologetic revolutionary. As a young Orthodox rabbi in the 1960s and ’70s, he was instrumental in helping build the Student Struggle for Soviet Jewry, a movement predicated on the idea that established Jewish institutions were doing too little to help their brethren behind the Iron Curtain. In 1985, he led a group of Jews in a guerrilla Shabbat service at the Bergen-Belsen concentration camp, a historic and intentionally symbolic episode organized in protest of President Reagan’s visit to a war cemetery at Bitburg, where members of the SS were buried, during a state visit to Germany. Four years later, months before the collapse of communism across Eastern Europe, Weiss and six others were physically attacked after they scaled the walls of a Carmelite convent that had been built at Auschwitz and conducted an impromptu Torah study session in objection to the Catholic presence at the site of so much Jewish death. Weiss’ arrest record is legendary and stretches from New York to Oslo, Norway, where he was detained in 1994 while demonstrating against Yasser Arafat’s receipt of the Nobel Peace Prize. 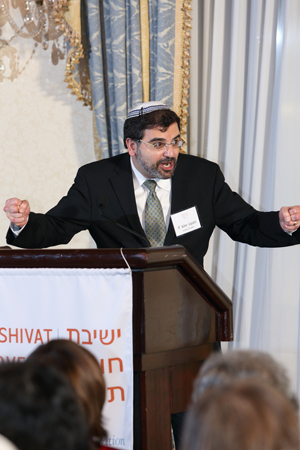 In 1999, Weiss broke with Yeshiva University, his intellectual home and the headquarters of Modern Orthodoxy, to start his own rabbinic seminary in the Riverdale neighborhood of the Bronx, Yeshivat Chovevei Torah, under the banner of what Weiss termed Open Orthodoxy: the view that stringent observance of Jewish religious law in the modern world should co-exist with ideological flexibility on a range of questions, particularly concerning the role of women and Jewish denominational pluralism. Four years ago, Weiss took his rebellion one step further and founded Yeshivat Maharat, a women’s seminary, headed by his protégé Sara Hurwitz, the first American Orthodox woman to be ordained. As a boy living in the Bay Area, where his father was a research chemist, Lopatin attended the Orthodox Congregation Beth Israel in Berkeley, then led by Rabbi Saul Berman, a leading Modern Orthodox scholar who now teaches at Yeshiva University. When Lopatin was 8, his parents decided to make aliyah and moved the family to French Hill, in Jerusalem. “We weren’t even shomer shabbes until we went to Israel, but we were Orthodox,” Lopatin told me. “We were very modern, but we never went to the Conservative shul.” The Lopatins stayed through the Yom Kippur War—which Lopatin remembers as a thrilling event—but after four years decided to return to the United States, moving to Boston. Lopatin enrolled at the Maimonides School in Brookline, which he found to be overly rigid after his experience in Israel. He successfully protested school administrators’ decision to cut the brief kissing scene from The Diary of Anne Frank but gave up on plans to promote a student boycott while trying to put together a student council after he was threatened with expulsion. “I did nothing exciting at the end of the day,” he acknowledged, a little sheepishly. In Chicago, Lopatin is credited with reviving the Orthodox community in Lakeview. “He knew he’d need an eruv and a mikveh and a school, and he built those things,” said Robert Matanky, a lawyer who helped Lopatin secure an eruv in the 1990s, shortly after Lopatin was named rabbi at Anshe Sholom B’nai Israel. Lopatin and his wife, Rachel Tessler, were instrumental in founding the Chicago Jewish Day School, a community school that opened in 2003, and they have been aggressive about expanding kosher options in their area, from arranging a Shabbat ice-cream exchange with a local sweet shop to helping open a nonprofit kosher barbecue restaurant in Lakeview. Yeshivat Chovevei Torah occupies the upper floors of a sand-colored building along the Henry Hudson Parkway, just across the Spuyten Duyvil Creek from Manhattan’s northernmost reaches. The ground floor of the building belongs to the Hebrew Institute of Riverdale, known as the Bayit, which Weiss founded in 1971. Its 850 members include Treasury Secretary Jack Lew and his wife, Ruth Schwartz. Every Saturday, they come to pray in a soaring space with a blue ceiling and an ark shaped like a Torah scroll. The bimah juts into the center of the space, in the classical style, putting Weiss, Hurwitz, and other clergy in the middle of the congregation. The chairs surrounding the bimah aren’t fixed, and sometimes, Weiss told me, he makes his male and female congregants switch sides of themechitza, just for the sake of it. The proximity of the school and the shul is intentional: Weiss told me he thinks of Chovevei as an educational institution along the lines of a teaching hospital, rather than a clinical research institution. Nevertheless, Shafran acknowledged, he could imagine instances where Agudath constituents and Chovevei might join in ad hoc efforts that don’t touch on liturgical or deeper philosophical issues—evidence that Lopatin will arrive in Riverdale without the baggage Weiss has accumulated in a lifetime of picking fights, and with a wellspring of goodwill to draw on. “I think some people on the right were disappointed he chose the path of joining with an organization they see as problematic ideologically,” Dov Weiss told me. “People love Asher. So, people who have antagonism toward YCT don’t know what to do with it now that he’s there.” Norman Lamm, the head of Yeshiva University’s Rabbi Isaac Elchanan Theological Seminary, declined to be interviewed about Lopatin but described his former student in a brief email as someone “whom I value and to whom I wish good luck.” Everyone I spoke with said it is probably for the best that Lopatin is not a maverick in the Weiss mold. “He will be in many respects a calming force,” said Jeffrey Gurock, a professor of Jewish History at Yeshiva who also sits on Chovevei’s board.